Serving a choice group international airlines right in the heart of London is a humble little airport that is still able to pack an ample sized punch to help keep it up in competition with its larger London counterparts. So as either a couple who is about to embark on a holiday that you have been avidly saving for, for the past few months or the hapless business who has been posted out to New York yet again to meet with clients for a ‘make or break’ business deal, you might find that your flight tickets bear the name of this charming little airport upon them. So therefore, let us discuss how to get you to London City Airport in the best possible manner. There are many things that need to be taken into consideration. One thing is; your safety. You don’t want anything to happen to you just as you are about to embark on a holiday of a lifetime, or for a crucial business deal, you want a mode of transport that will treat you with the utmost of care. Secondly, you want comfort. You have put up with substandard transport for the vast majority of your life; you want your holiday to start off in the best stead so why not pay that little bit extra for ultimate comfort. 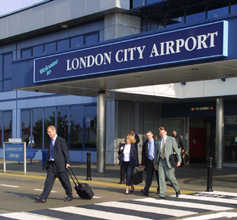 The final component to a good method of airport travel is getting you to London City Airport on time. This is vital as you well know, if you miss that certain and strict check-in time that is stipulated by all the airlines that serve the UK then you truly are scuppered and at a very lose end. This will ultimately leave you very red faced and not kick off your holiday or business trips in the best possible manner. In fact, it may go as far as destroying the good mood and morale that you need to covet so much completely. So, let Lux Limo hire allay your fears and guide you with all due course to the best possible mode of transport that will be vital for your travels to London City Airport. The answer is simple; you can order a black, pink or white limousine, a Hummer limo or a Chrysler limousine to take you safely, soundly and in a whole world of luxury to the front entrance of the airport. From there our chauffeur will endeavour to help you with your luggage so you can check in safely and then bid you farewell. We here ate Lux limo hire believe that cheap limo hire should be readily available to you. So why struggle with your luggage on and off trains and in and out of minicabs when you can cut out the middle man by coming straight to us. Sure the other modes of transports work but they ultimately can’t be trusted with quality of service, delays, lateness and cancellations. That is why we urge you to put your faith into us here at Lux Limo hire.